While thinking something I get to think how things come from and a thought that always rise in me came to answer that everything is because of ‘hard work’. The hard work that done physical is behind everything and nothing comes easily without a stress. Today everything has turned mechanize and computerized, but still there is something called hard work being built behind the machineries and each machine depends on either, hooked like a chain which is in hands of hard workers. I believe if we dug deep into a machine, it will end up at the hands of labors, who hard work. Around the world, the hard workers are not getting there real worth for their cause and almost goes to the owners who just own things. I just see it through my eyes and feel it through my sense, that those don’t know what hard work means and never care about it, survives with joy and celebrate in parties. Those who hard work works all along there life, ill treated by owners and managers, and infamous and rich keep them under service. I sense what hard work means even thought I don’t do anything hard, and for me every movement is hard work and I know because I go through the moments that unbearable stress being borne by my parents to give me life everyday. I believe the hard work never and should not fail, and it brings smile on our face and makes life easier. Basically all comforts come from hard work and our lives are bound to be. A candle that blown out more than a decade ago, and still continue to glow brighter in our hearts and continue to be so. The candle I like to mention her is Mother Theresa, whose birth centenary is celebrated today. I see her as a candle that melts itself to give light and life to others, and of course our mother’s vision can’t be easily appreciated, because her life is a mission that starts missionaries of charity to aid and feed poor, sick and orphan people and those dying for. Mother Theresa has dedicated her life to the poorest of the poor and this dedication has become her life’s ambition. Thus her ambitious passion brought her the Noble Prize for peace, by appreciating her service and compassionate. The Albanian born mother is named originally as Agnes Gonxha Bojaxhiu and as per the rule of changing the name to become a nun, she chose the name Teresa – whom she vow to become as Teresa Martin, a nun and missionary who dedicated to poor and sick people. The 18 year old, sent from the Ireland’s nun’s home, where she learnt English, came to India and joined the West Bengal’s Christians church and served as a teacher at Loreto convent school in Calcutta. The worst situation in Calcutta then in poverty, insanitary and over all the pavement dwellers being fed besides the drainage wring her heart and thus she decided to live for them. After receiving the Indian citizenship, she abandons the Loreto nun’s home practice and began to wear a simply cotton sari. 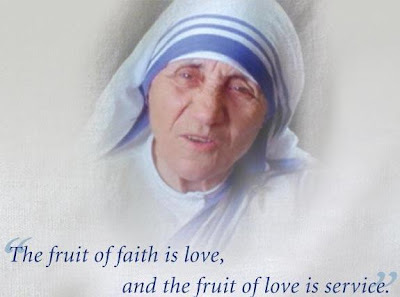 After Vatican’s permission, she started the missionaries of charity and later a home for poor and a hospital to them. She also stated a home for abandoned and orphans, and thus by devoting herself to service the poor and sick patients, she had been talked by everywhere around the world, and it left in peace and struggle when she passed away in her 87th year. Today being her birth century , India is yet to commemorate her by releasing her postal stamp and this is just not enough, and we all need to keep in mind that we do at least what she had done immense to others. Let peace sings to mother. and the rain stops, before it flood and drain. 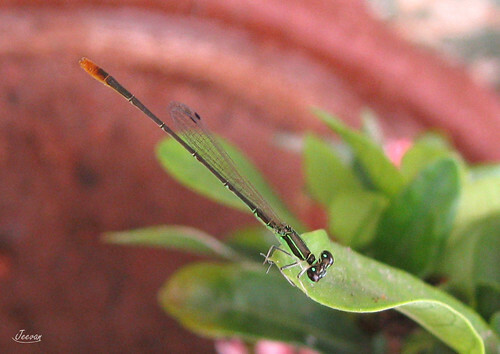 The needle dragonfly in the picture is captured in my home garden. I love this species from my childhood and had attempted to catch them many times. The Robot (Endhiran) is out in audio and it simply rocks more or less. First time listening I felt quite instrumental and sound of metal and its no wonder because music is by A. R. Rahman and to add sugar the movie is about robot, a mass made of metal. It wasn’t a great disappointment to me and I didn’t expect anything from the movie except it’s a Shanker movie. About the music ARR could have reduced the noise of instrument and avoid rap potion. SPB, who is always fascinated to the introduction songs of Superstar, is here along with ARR and his daughter Khatija Rahman to call the New Man to earth. The song ‘Puthiya Manitha’ has given life to the robot! ‘Kathal Anukkal’ is soothing in the flow of Vijay Prakash and Shreya Ghosal! The song is energetic and charming to keep away the melody. Sure the picturesque would be very beautiful says the sample pictures in the lyric book. ‘Irumbile oru Irudhaiyam’ is so hot in Kash n’ krissy vocal and ARR has given good company in expressing a robot’s emotion and love. The song is rapid and the English verses have added attraction. I think the lyric book is given to understand the lines that goes immerse in music at many places. ‘Chitti Dace Showcase’ is head aching! A rap which has given way to strong instrumental esp. the drum beats. ‘Arima Arima’ has elevated the theme from the deep breath of Hariharan and Sadhana Sargam has done her brief part in sweet. The music has put a bravo walk in this robotic show. ‘Kilimanjaro’ is very interesting and Pa.vijay has played with lyrics, so playfully. The song has well rhymed in Javed Ali and Chinmayi voice and it sounds like a tribal song. It’s my favorite song in the album and seems like it was captured in a adorn manner. Aaha Aaha… and Heako ennikkoni… at the each stanza cause prettiness and add giggle to the song. ‘Boom Boom Robo-da’ has an excellent rhythm from the string and it sounds alike the Shivaji’s Athirade! The lyrics are well related to science and childish love and it was written by Vairamuthu’s son Karky. The female singers sound so hot and sweet to cause passion and romance.